The Page 99 Test: Andrew Urban's "Brokering Servitude"
Andy Urban is an Assistant Professor in the American Studies and History departments at Rutgers University, New Brunswick. 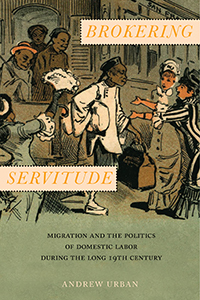 In Brokering Servitude, page 99 marks the start of chapter three, “Chinese Servants and the American Colonial Imagination: Domesticity and Opposition to Restriction, 1865–1882.” This chapter explores how Americans debated incorporating Chinese immigrants into the national economy as domestic workers, and how Chinese servants and cooks navigated the discriminatory and racialized labor markets they encountered. White Americans accused male Chinese servants of transgressing the gendered boundaries that delineated men’s work from women’s work. Among both pro- and anti-Chinese factions, the ability to perform labor that was coded as feminine was seized upon as a racial feature that made Chinese immigrants distinct. As I argue, observers conveniently ignored how legal and extralegal controls on Chinese immigrants’ freedom of contract relegated them to stigmatized service jobs where labor shortages were regular. White moderates sought a compromise solution with anti-Chinese activists in which Chinese immigrants would be allowed into the country to work as servants – through newly imagined guestworker visas – and removed when no longer needed. 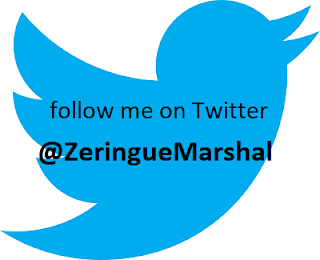 In relationship to my book as a whole, chapter three is anchored by a question that is present throughout the manuscript: how did migration policies get debated, forged, and implemented with a mind to expanding or limiting the domestic labor supply, and what attitudes about race, citizenship, and gender informed these actions? “The Servant Question” assigned a familiar Irish cast to the problem of obstreperous white servants, and implied that with Chinese immigration restricted, the difficulties that these laborers posed would only grow. The broad faces and pug noses borne by the job applicants mark them as Irish in contrast to the aquiline facial features of the woman evaluating them for hire. 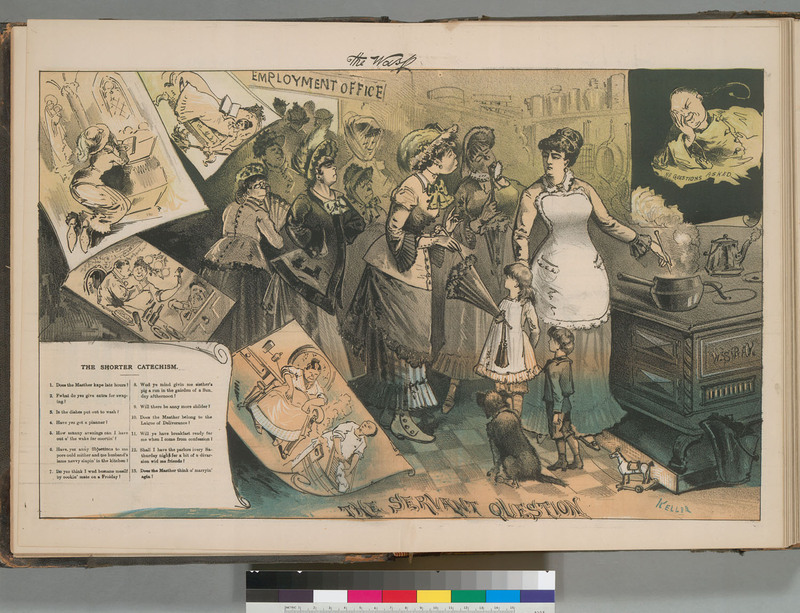 The text in the lower left-hand corner of the cartoon, which is presented in a solecistic written version of the Irish dialect, is titled “The Shorter Catechism,” an allusion to Irish immigrants’ Catholicism. Rather than respectfully submitting their qualifications, the applicants initiate a ruthless interrogation designed to vet the household’s personal, political, and economic standing. Nothing is off-limits. The Irish servants’ “catechism” provides a glimpse at the fault lines separating household laborers from employers. One inquiry posed to the prospective employer by the fictional gang of Irish servants who have gathered in her kitchen is whether she would “mind givin me sisther’s pig a run in the gairden of a Sunday afternoon?” Middle-class publications frequently reported the outlandish requests that Irish servants allegedly made, and jokes of this nature became a staple feature of late-nineteenth-century American humor. In the “Servant Question,” cartoonist Frederick Keller shows a racially-caricatured Chinese servant hovering in the background, with the text, “No questions asked.” Unlike the Irish servants to whom he is compared, there is no incessant interrogation of the employer. As is the case today, the demands of household consumers could temper anti-immigrant rhetoric – albeit not always for noble reasons. John C. Hulsman's "To Dare More Boldly"
Rick Shine's "Cane Toad Wars"
Adam Winkler's "We the Corporations"
Susan Goldman Rubin's "Coco Chanel"
Harvey G. Cohen's "Who’s In The Money?" William I. Hitchcock's "The Age of Eisenhower"
Amy Wallen's "When We Were Ghouls"
Alexandra Cox's "Trapped in a Vice"
Patricia Fara's "A Lab of One’s Own"